5.1 Do you really need it? 5.2 Why You Need a Kid-Centric Video Monitor? 5.3 Which Type Is Best – Video, Sound, Or Movement Monitor? Are you a loving parent and want to monitor your baby as well as accomplish some house chores while your baby sleeps? It’s high time you get the best baby monitor or video monitor. Well, baby monitors, whether audio or video help you do just that. With a baby monitor on your team, you will easily complete chores as well as keep an eye and ear out for your baby’s call. Nowadays, these devices feature groundbreaking technology that measures the baby’s vitals and notify you when the vitals spike above or below normal. In some extreme instances, the baby monitors have been known to not only save lives but also help avoid life-changing health complications in babies. That’s why we have featured the monitor list in 2018 and provided a buyer’s guide for them. Here are top rated infant/baby monitors below. This list is revised every month to keep the audience updated. Last, this page was edited on 7th October 2018. First on our list is the Infant Optics DXR-8. If you’re a new parent and you just got your newborn baby, you would want to get the best monitor on the market that has no chance of malfunctioning or breaking down. We tested this DXR-8 side by side with other monitors to see how it matched up with the others. Right off the bat, you would be inclined to pick other models due to their larger 5-inch screen over DXR’s 3.5-inch screen. In today’s world, there’s no doubt that larger screens are more appealing and give the impression that gadgets with big screens are better equipped than small screen gadgets. However, this is not the case with this DXR-8 as it proved to be the better choice with regards to functionality. Its camera in the baby’s room is equipped with music playback with four different lullaby songs. The DXR also features a night light mounted on the camera that you can remotely switch on and off. Unlike some models had lagged screen control, the DXR was very responsive and easy to use. Also, the DXR recorded an impressive 200+ inches of range. Other models would go out of range as soon as we stepped out of the house. This was one of a series of range tests that we performed and this DXR proved to be superior to most models. We also measured their signal penetration level when we separated the screens from the cameras with walls and by shutting all doors. The DXR proved superior in this test as well. Despite all its glory, we feel that the manufacturers of the DXR-8 could have incorporated a larger screen to this device to match or better their competitors. Other notable features of the DXR are the temperature display of the baby’s room and a much brighter and clearer screen compared to other models. These features not only allow you to monitor the baby but also set the optimum conditions for the baby to thrive. 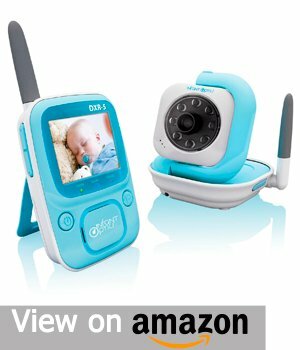 It is one of the best video baby monitors. The first impression with this Samsung SEW is that it has good color and range. It has a 720p camera with excellent image quality and color that allow you to push the range limits of the screen. However, it starts to lag when you start going off the range. For a better view, it is better to mount the Samsung SEW a little bit further back to capture the whole room in the screen. For parents who have twins, the Samsung SEW is the baby monitor for you. You will love its split screen monitoring function that lets you mount various cameras around the twin’s room and monitor them using this innovative function. Also, the audio quality of this device is top notch. You can pick up slight sounds such as when the baby sneezes, coughs and even farts. The monitor quality and the touch screen capability impressed us than most other brands out there. The command response was fast and easy to control. The touch screen’s quality was crisp and remained the same even with the introduction of a screen protector. With today’s technological capabilities, it’s a real shame that no baby monitor manufacturer has featured a full high-resolution camera and screen. Another frustrating thing we noticed about the Samsung Sew is that it was susceptible to major signal interference whenever we used the microwave or remotely opened the garage door with the camera in sight. Night Vision with Non-Visible IR LEDs up to 16 ft. 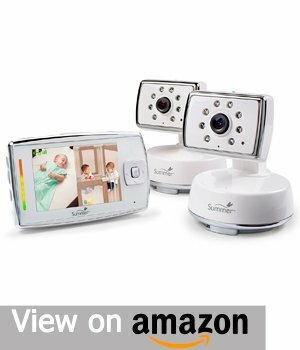 The bottom line is that this device is among the best baby video monitors on the market. Its split-screen functionality that supports multiple cameras is a good feature for people with twins. Third on our list is the Infant Optics DXR-5. As you’ve probably guessed by now, the DXR-5 is very similar to the DXR-8. They are both from the same company and share some characteristics. The DXR-5 is one of the best baby-monitors that we’ve tested in 2018. Its performance is right up there with the best and even outperforms the best in certain aspects. It has no noticeable delays; it features a good picture and sound quality coupled with great touchscreen sensitivity and functionality. Clumsy newborn parents will be impressed with its durability. We happened to accidentally drop it a couple of times when testing it (on hard floors) and to our surprise, everything kept working fine. This, however, is not to encourage people to handle this device carelessly, we advocate for careful use of this device to boost its lifespan. You can even take this DXR-5 on vacation or travel to a relative’s house or even a hotel. It’s a great tool for helping babies fall asleep while also allowing parents to sleep better knowing and seeing that their baby is doing fine. We liked this device a lot and couldn’t find any hitches with it, so if we’re nitpicking, the biggest thing we didn’t like about the DXR-5 is the screen brightness. While the brightness is adjustable, you may struggle with the bright screen during the night when your eyes are not fully adjusted. Also, the voice-activation power-saving mode on this baby monitor worked quite well as it would automatically shut down if no noise was detected for three minutes but it was also quite annoying. It would click and make static noises when it powered back on. We were not happy with the noises as we found them disruptive for sleeping babies. All things considered, the DXR-5 is a great device that has many features, offers great reliability and is highly durable. We happen to love it a lot and we recommend it to all new parents. Summer baby monitors have gathered a large, loyal customer base over the years for their superior user experience and reliability. The camera quality for this device is clear and you can easily tell if the baby is asleep or awake. The speaker is also nice and loud such that you can hear all types and sounds coming from the baby’s room, whether its lullaby melodies, cries or other sounds. It has a temperature setting which is useful for letting you know the temperature of the room so that you can adjust it if need be. The split screen functionality is ideal for monitoring twins or multiple children at once. However, you can only listen to one microphone at a time if the babies are in separate rooms. If you’re worried about the battery life of the Summer, you definitely should not, because it features a powerful battery that’s incredibly durable and can last for hours on end. You don’t have to worry about the fact that your babysitter likes to leave the video on at times because when you get home, it will still have plenty of charges to last the whole bedtime. On to the negative aspect, we didn’t like the loud static noise that is produced when the monitor is at its lowest volume setting. It is loud, irritating and we found it hard to sleep with the monitor in the room. Also, unlike the previous model, the Summer Infant failed to include a sound scan that would switch audio from all cameras after every three seconds. 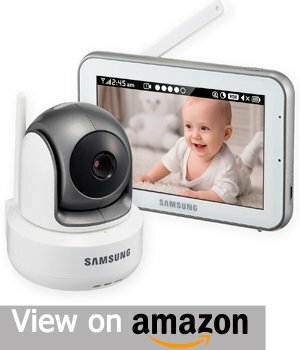 You can monitor your baby with this device’s Colored Video Monitor Set. With a two-way audio communication system and highly responsive sound activated LED lights, parents and babysitters can ‘see’ the noise level in the room. You must be thinking, another Summer Infant baby monitor? Yes, and that is because Summer Infant has got it right with both of these monitors we have featured. After testing some high-end baby monitors, I wouldn’t have thought that any other monitor would top their screen resolution, but that’s exactly what this device did. Product developers at Summer Infant have raised the bar for baby monitors when it comes to screen resolution. 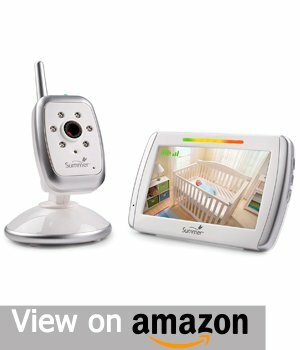 Once you set up the camera in the room, you will be able to closely monitor your baby’s activities through its wide-angle camera and impressive five-inch screen even during the night with the help of its night vision technology. So whether you’re in the kitchen, living room or out on the yard, this baby monitor will perform admirably with its rechargeable batteries and an impressive range of up to 600 feet. Two-way communication allows secured encrypted communication through the baby monitor. Communication is enabled through the baby monitor’s unique frequency that is encrypted for security purposes. It also features sound activated LED lights, power-saving mode to preserve the battery and also notifies you when the battery is running low or when you start getting out of range. 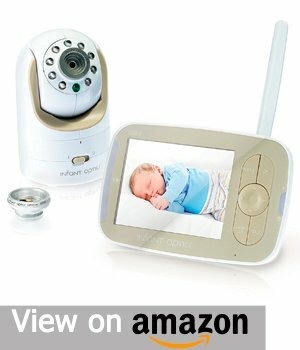 Its swivel camera can capture the baby wherever in the room the baby is positioned. You can either place the camera on a tabletop or mount it on a wall using the mounting hardware and security clips that are included in the packaging. When it comes to the negative side of things, this device lacks a temperature gauge to measure the room’s temperature. This is annoying since most baby monitors come equipped with this feature. Also, we noticed that the battery life in the Summer is not so impressive unless you use the battery saving mode which will give you a few more hours of use. All things considered, it was easy to put together and use, so that was a big positive. Despite the few negatives, we loved this device, and it performed well in our tests. It was also one of the quietest models on the market today, unlike other models that produce annoying white noise. So many times you hear stories about how a baby died or almost died due to something sticking in the baby’s throat, blocking his or her airway. Experiencing this situation with a baby can be very traumatizing for parents but can also be eye opening and one experience they would not want to go through again. This is where the Snuza Hero SE comes into play. The Snuza Hero is an innovative device that monitors your baby’s bowel movements. It is easy to understand and use. You can use the breath monitor beep to listen to your baby’s breathing to ensure your baby is healthy. It has three volume settings that you can adjust according to the activity you’re doing at that particular time. For example, when doing house chores, you can set it to the highest volume to ensure you hear your baby’s breathing. With this Snuza, you will be able to sleep comfortably without fear that your baby would stop breathing without knowing. You can use this device until your baby is about nine to ten months old or old enough to stop fearing that he or she might stop breathing. You simply clip the device to the baby’s diaper and put some clothes on the baby and listen to the breathing patterns. The only problem with this device is that if your baby moves a lot when sleeping, the beeper is prone to moving and this might set it off. It might raise a false alarm when the beeper comes loose and goes off accidentally. This, however, can be avoided if the device is properly clipped to avoid coming loose. The Snuza is tiny and comfortable for babies, and they barely notice when it is clipped on their diapers. Ultimately, this device could be the difference between your child’s death and survival and for that reason alone, I would highly recommend it to all new parents. Seventh on our lineup is the Philips Avent. It has many great features that have landed it this spot on our list. Its long battery life can last for over 14 hours of constant usage until it starts notifying you that the battery is getting low. Our tests showed us that you would never experience charging issues with this device. The Avent comes equipped with a night light that provides sufficient lighting to enable you to change your baby’s diaper in the night without hurting both your eyes. We found the thermometer gauge pretty handy during super-cold winter days and super-hot summer days. You simply set the ideal temperature for your baby and the Avent will alert you if the temperature gets too low or too high for the baby. This baby monitor range is impressive. This monitor picks up the slightest of sounds so whether the baby is tossing and turning or crying, you can be able to tell. You can be at the edge of your property or even at your neighbor’s place and hear your baby perfectly. What’s more, you can alter the sound settings to vibrate mode when doing loud activities such as mowing the lawn to feel the vibration when your baby is awake. You can adjust the sensitivity feature on this Philips. For instance, you can turn down the sensitivity when the white noise machine or when the fan is on so that the monitor is not constantly blinking. The device allows you to turn the sensitivity up when in a noisy environment so that you can hear when the baby is up. With this Philips Avent, you’re getting a good deal. It has many more features that cannot be all mentioned here. You are guaranteed a good night sleep knowing that this baby monitor will alert you should anything happen. 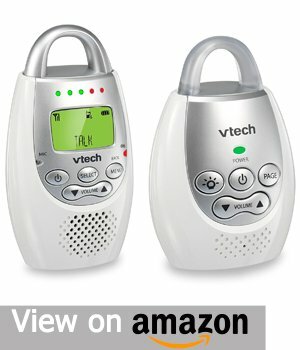 The VTech is one of the most reliable baby monitors on the market today. It uses DECT 6.0 Digital, a cutting edge technology that ensures transmission between you and your baby is crystal clear without any interference. With DECT technology, you can sleep easy knowing that you’re the only one with access to hearing your baby through the device’s secured an encrypted signal. Babies need love and attention from their parents to calm and soothe them. This is where the talk-back feature comes into play. It allows you to send soothing and calming messages to your little one from anywhere within its range through the parent’s unit. The VTech comes with a loop on the baby’s unit that lights up as a calming night light for your baby. Its backlit display is soft and easy to read even at night without hurting your eyes. You can visually monitor the noise level in your baby’s room even with the receiver muted through the five LED lights mounted in the parent unit. If the noise level is high, more lights on the parent unit will go off while if the noise level is low, you will see less light ups. When in vibration mode, the parent unit will vibrate to notify you when your baby is awake or crying. The only problem we encountered with the VTech is its annoying beep it makes when it loses signal. When it makes those beeping sounds, it means the device is not linked, and you would have to turn it on and off again for it to stop. It can be annoying when the beeping happens in the middle of the night. All in all, the VTech is a great monitoring device. Its impressive 1,000 feet range is a class leading range that lets you monitor your baby from long distances. It has a battery life that can last up to 18 hours, and it is lightweight and therefore very portable especially with the belt clip that allows you to attach it to your pants. Ninth on our list is the HelloBaby HB24. It is a wireless video baby monitor that excels at letting you monitor your baby through video technology. The device provides crystal clear image quality free from grainy pictures or pixelated textures. Sleep peacefully or carry out house chores peacefull knowing you can see your baby’s activities both during the day and at night with the integrated night vision system. The night vision system works excellently. It uses Infrared LED lights to adjust according to the brightness of the room and then transmits clear black and white images to your screen. The Hello Baby parent monitor combines many factors to make it highly portable. First, its lightweight nature allows the parent to carry it seamlessly around the house. Secondly, it features a 950mAh rechargeable battery that is capable of lasting for over eight hours with the screen on so the parent or babysitter doesn’t need to keep recharging it. Lastly, the baby monitor has a range of 960 feet allowing you to move freely without worrying about losing connection to the baby’s unit. Some of its other features that you need to know include, the talk back feature that allows you to soothe your little one when crying. It features bright LED designed for notifying people with hearing problems that their baby is in a state of unrest. Power saving mode coupled with the function of turning the monitor to audio mode only helps conserving battery. The baby unit is equipped with a room thermometer that records the room’s temperature and displays it on the parent unit to know if you need to adjust the temperature. Also, the Hello Baby monitor has eight polyphonic lullabies to comfort the baby. Onto the negative aspects. First, let me say that everything about the Hello Baby monitor is great and the camera quality is great, but we did notice some lags on the monitor at times. Despite the occasional monitor lags, we would recommend this device to all new parents. This device proved to be extremely reliable and is one of the few baby monitors to have so many useful features that make it worth the money. Last but not least is the Motorola MBP36S baby monitor. This is the latest and more technologically advanced version of the Motorola MBP36. It features an upgraded audio and video input and output system that was overhauled from the previous model. With that said, let us dive into the specifics. When comparing the audio quality of the Motorola MBP36S to the Motorola MBP36, the audio quality of the MBP36S is much better and clearer. The newer Motorola MBP36S is sufficiently loud so that you can easily squeeze in a hundred things on your to-do list without worrying you’ll miss anything while the baby naps. The MBP36S has night vision that uses infrared technology. Its monitor features a plastic button that is highly durable and effective while at the same time retains its print unlike some rubber buttons on other models which the print fades with time. Split-screen functionality is also availed with this device for parents with more than one child in more than one room. You no longer have to worry when you misplace your charging cable with this MBP36S. This device utilizes a micro USB power cable for recharging, therefore, if you’ve lost your power adapter or needs to charge this monitor in different parts of your home, you can just use your phone charger if you’re an Android user. The camera uses the traditional male & female pin that can be easily replaced if accidentally misplaced. We liked almost everything in the MBP36S, but the pan/tilt feature. Also, we noticed that whenever you used this feature, the audio would pause when the camera was tilting. We retested to confirm our findings and even the previous model, the MBP36, did not do that. 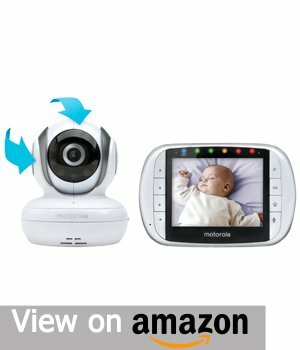 If you’re thinking of buying a Motorola baby monitor, we recommend the newer version, the MBP36S, over the older version, MBP36S. Despite its weakness in tilt/panning function, we believe its superior audio and video quality represent better value for money. As far as we can tell, the DXR-8 is the latest model from Infant Optics. Not only is it sleek but has been designed to optimize at audio and video quality. Audio is excellent at both the transmitter and receiver. The transmitter records the slightest of baby sounds and other sounds like humming noise from an air conditioner. The battery life on the DXR-8 is amazing. It can last up to ten hours on power saving mode without the need to recharge it. It also features an exchangeable lens system that gets you a close-up view of your baby or gets a panoramic view of a mobile child. But it is the wide-angle, panoramic view that impressed us. You get to see the entire room without the need to mount more cameras in the room. These features highlighted above coupled with other features such as two-way talk, screen off, audio mode on, temperature monitor, sound activated LEDs and others made us pick the DXR-8 as the best option to buy in 2018. Different baby monitoring devices come equipped with screens of different sizes, and some of them have high-resolution HD qualities. Naturally, larger screens with HD capabilities performed best of all video baby monitors both in daylight and in black and white night vision. Perhaps this is the most important aspect of these devices as they primarily use audio to notify the parent when the baby is in distress. We determined the audio quality through the loudness, sound quality, and sound filtering. 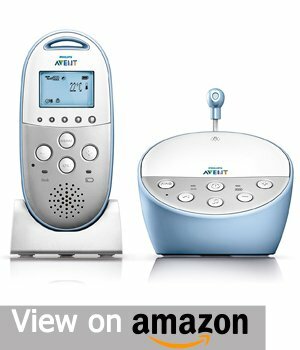 A good audio baby monitor should be sufficiently loud without being over the top and should also be able to filter out unnecessary noises and pick up most of the baby’s sounds. Baby monitors come with different capacity batteries. We realized that video baby monitors had a larger battery capacity compared to just audio baby monitors since video playback consumed more battery power. Poor battery life in baby monitors limits portability because it requires constant recharging. Installation played a huge part in our rating system. We factored in whether an account needed to be set up and the existence of any extra subscription fees. Every unit we tested had the same design with cords protruding off its back, so design wise, they all received a pass. However, for safety purposes, parents should carefully set up the cords and wires away from children’s reach. Our signal strength tests revealed to us the level of signal penetration in concrete walls and floors, and in wooden walls and doors. It also helped us determine how far you can go from the baby’s unit before the signal drops off and cuts out completely. So don’t believe everything indicated on the packaging. You want a great sounding baby monitor. We compared the loudness, sound quality and sound cancellation of all the models we tested. 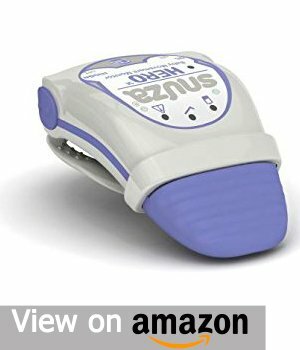 We were looking for a baby monitor that not only had sufficient sound to notify the parents when the baby was in distress but also a device that could cancel out the noise and pick out the baby’s distress call. We tested the video quality both during the day and at night. We discovered that the quality of the video largely depended on the camera mounted on the baby unit. Our tests involved looking for cameras that displayed crystal clear images to see if your baby was awake or asleep. Since no parent would want a stranger monitoring their baby illegally we decided to carry out this test to determine which baby monitors were safe and which baby monitors were prone to hacks. We discovered that all the monitors we tested had security features integrated into their communication channels and transmitted encrypted signals. Every parent wants a simple but sophisticated baby monitor. No parent wants to start reading a 100-page user manual on how to use a baby monitor. They want something they can set up and start using straight away without wasting time on manuals and fortunately all baby monitors we featured were straight forward to use. We must say that we found some features were more useful than others and that different baby monitor models performed differently. For us, we were keen on features such as night vision, talk back feature, lullaby feature, night light, tilt, and pan, LED light indicators, range, and battery life. Our survey indicated that most parents bought baby monitors for their peace of mind. Some went with the more expensive video monitors as opposed to audio only monitors since they thought audio alone wasn’t enough. They needed to see their baby when sleeping. So for value, we pitted video monitors against each other and audio monitors against each other. Frequency Band: We recommend you look for a monitor that uses a different frequency from your phone to avoid getting static noises when the two devices come into contact. Batteries: An important consideration is the battery life and if the batteries are rechargeable. Hand-held Audio/Video Parent Unit: Ensure that the screen is large enough for you to see your baby and the speaker is loud enough to notify you when the baby needs your attention. Night Vision: This feature is important in seeing your baby sleep during the night without having to turn on the light, disrupting their sleep. Motion and Sound Sensors: The receiver notifies you when your baby makes an unusual sound or moves awkwardly when he or she wakes up. Sound and Lights: Your receiver will light up whenever your baby makes a noise and continues getting brighter with an increase in noise level. Out-of-Range Indicator: Flashes a light to indicate you’re getting out of range and when you’re completely off the range. Low-Battery Indicator: Flashes a light to indicate the battery is running low and when the battery is completely drained. An Extra Receiver: With an extra receiver, you can leave one in the bedroom and attach the other on your pants or take one for yourself and give your spouse the other receiver. Expandability: You can add up to four cameras on some monitors which can help if you have more than one baby in one room or different rooms. Connectivity: Some monitors are compatible with devices such as your smart TV whereby you can watch your favorite program or sports show while monitoring your baby. Audio Monitors: Fortunately all models we tested had this feature. Analog Monitors: Sends signals directly from the transmitter to the receiver without encryption and other security features. Digital Monitors: These monitors encode signals that are being transmitted before they reach the receiver. Video/Audio Monitors: Sends both audio and video signals to the parent unit. Wireless Network Monitors: Allows you to use other devices such as your smartphone, tablet, and computer as a receiver. Range: Be careful when purchasing these baby monitors. The manufacturers of these devices only indicate an open field range on the packaging. This can be very misleading because these devices are intended to be used indoors with many obstructions such as walls and doors as well as interference such as microwaves and other signals. Sound Activation: This feature is important when it comes to your peace of mind. It helps to turn off static noises picked up by the microphone in the baby’s room. Features: Nowadays, people want devices with bucket loads of features since they associate more features with prestige. In the case of baby monitors, we have to warn you that you might spend a fortune on a fully featured device but only use those additional features once or twice during the device’s lifetime. Consider Digital Over Analog: We recommend a digital baby monitor for its privacy and security measures over analog baby monitors. Analog baby monitors are prone to hacks, and anyone can spy on you and your baby as long as they have the frequency you are using. Digital, on the other hand, encode their signals to ensure that only you can receive the signals transmitted from the baby unit. Consider Other Wireless Devices: A potential problem with wireless baby monitors is a signal interruption from other wireless devices such as Bluetooth speakers, internet routers, and cordless phones. Tackling this problem requires you to change the frequency of your baby router or change the frequency of your home router to avoid digital interruptions. Consider Your Home and Lifestyle: The way you live should dictate the kind of baby monitor you will buy. For example, If you have a big house, look for a baby monitor that offers a long range and one that comes with at least two receivers. If you have more than one baby in the house in different rooms, consider getting a baby monitor that supports multiple cameras. Check Out the Return Policy: This is the first rule of buying. Ensure that you can return the baby monitor if you experience unsolvable issues such as consistent interference from other wireless devices in your home. Always read the return policy to know when it expires and be sure to store the receipts safely just in case you might need to return the product. You don’t need a monitor if you sleep in the same room as your baby since you can hear and see what your baby is doing. However, if your baby sleeps in a different room, you will probably need a baby monitor during the baby’s down time so that you can easily and comfortably rest or get some work done. Why You Need a Kid-Centric Video Monitor? If your home has top of the line security cameras, you’re probably wondering if there is need to install a baby monitor when you could just re-purpose the security cameras to monitor your baby. Needless to say, we tested this theory to see how security cameras would compare with dedicated baby monitors. We used Nest Cam as our security tester and the initial results did not surprise us at all. The 1080p 30fps camera proved superior to all other baby cameras we tested. We discovered that the video quality on the Nest baby monitor was sharper, more detailed and included features such as push-to-talk as well as motion and sound sensors that would benefit newborn parents. What’s more, you can continue using the Next Cam when your baby is all grown up to continue monitoring your home. Something baby monitors would find difficult to do. With these features, the Next Cam excels at baby monitoring on paper, but we still feel that it falls short on practicality. Its setup was primarily made for security purposes and excels at that task, however, it lacks certain baby oriented features such as lullabies, night light, and camera sound quality fell short compared to baby monitors. For these reasons, we believe kid-centric video monitors offer unique functionality that new parents will appreciate more than security-based cameras. Which Type Is Best – Video, Sound, Or Movement Monitor? While all these types of monitors have their strengths and selling points, we couldn’t help but feel that sound monitors were the most important as parents rely on sound for notification. Practically, a sound is the most reliable medium for alerting and notifying parents when their child needs attention. When you’re napping or caught up in work, the sound will prompt you to wake up or stop working to listen to gain more information about your baby. Without the sound, monitors would be almost useless. As a parent, when your baby grows older, you get to differentiate different sounds with different needs of the baby and so sound lets you know what is happening with your baby. Sound and video work hand in hand with monitoring a sleeping baby. The sound alerts you that your baby is awake and the video lets you see what is going on with your baby to let you know whether or not he or she requires your immediate attention. Sometimes babies wake up and self-soothe back to sleep within moments so with a video monitor you will be able to determine that nothing serious is happening. With a sound monitor, you only listen to clues without having the full picture of what is going on in the room. Movement monitors go beyond sound and video monitors in an attempt to notify you, should your baby stop breathing. These movement monitors come in various types but work using the same principle. Some movement monitors are attached to the baby while others on the mattress. Normally, they work by detecting the baby’s vitals such as heartbeat and breathing patterns and notify you when irregularities are recorded. The controversy with these devices is that their effectiveness is questionable. Also, some health institutes have warned against buying of these movement monitors since they are new to the market and there is insufficient data to indicate that these devices work. Also, there were cases where the devices issued false alerts when they came loose and couldn’t detect the baby’s vitals. These false alerts are risky because they give parents panic and stress. Another risk with these devices is that once a parent gets used to these false notifications, they get immune to them. This creates a dangerous situation such that when an actual emergency occurs, there is a huge chance they will shrug it off as a device malfunction. Are the picture and sound quality good enough? Can it be easily hacked? Is the range indicated on the package true? According to consumer reports from a CPSC report, at least seven children under the age of one have passed away from strangling by monitor cords since 2002 in the U.S. Ensure that your baby monitor wire is a meter away from the child’s grasp, cot, crib or general play area. Baby monitors can be used as an extra set of eyes and ears but not as a substitute for a person. They help parents and babysitters keep an eye on sleeping babies and should be used as a tool for alerting you to a situation before it becomes serious. Dropcam is a San Fransisco based company that manufactures security cameras and cameras for monitoring children and pets. An example is the Dropcam Pro that is one of the best Wi-Fi baby monitors. Fisher-Price is a product manufacturing giant of baby equipment that ranges from electronics such as tablets and baby monitors to plastics such as toys and learning tools. Their broad wealth of both indoor and outdoor products are for children aged below five years. Since inception, Graco continues to evolve with time. It started out as a steel works company and fast forward to the 21st century. It is one of the leading companies of baby monitors. This came along in 1988 when it acquired a product manufacturing giant that dealt with baby equipment. MobiCam is a leader in developing health, personal care, and home electronics. Their smart technology devices such as baby monitors, ear, and forehead thermometers, among others have won awards for their innovative designs. Philips and Avent teamed up to make some of the leading baby care products not only in the UK but around the globe. Avent is popular for its baby feeding equipment while Philips is famous for its innovative baby monitors that feature groundbreaking technology. Safety 1st a company that specializes in producing home safety products for kids and babies. It was launched over 30 years ago and has grown to continue producing home safety equipment to help keep children safe. Sony is a household name that I need not mention much. It is a multinational conglomerate from Japan that has diversified business interests in electronics, gaming, and entertainment. Just like the name, The First Years is a company that specializes in producing baby care products ranging from electronic gadgets to baby feeders and other products. Their product line includes baby monitors, pacifiers, blenders, toys and other countless products. Q: How do I select the right baby monitor for my family? The right baby monitor for you and your family should meet your needs regardless of its price and features. Q: What types of baby monitors are available today? There are three major types of baby monitors. Namely: Audio monitors, video monitors, and movement detection monitors. Q: Where can I buy a baby monitor? You can find these devices in retail stores and online retailers like Amazon. Q: Should I use my friends baby monitor now that her family is done growing? We highly recommend using a new device that meets current safety standards. However, if you are not in a position of buying a new device, ensure that it meets all the current safety standards. Q: How easy is it to set up my wireless video baby monitor? Simply plug the camera and receiver in the mains. The camera will then start transmitting live video and sound when you turn on the devices. Q: Should I choose a video monitor or an audio monitor? Both devices work well, but we recommend you get a video monitor if you can because it does everything an audio monitor does while also letting you see your baby. With a video monitor, you don’t have to rely on just sound to figure out if your baby is safe. Q: What is wireless video technology? Wireless video technology uses radio signals to transmit video and audio instead of traditional cables and wires. Q: How far away can I use it? It depends on the brand and model. Normally, manufacturers indicate the range on the packaging to let you know the range. Some monitors can transmit to a range of up to 100 meters. Q: It is wireless, but there are cables included. Why? The wires are included to power the device. Wireless means that it uses wireless signals to transmit audio and video over to the receiver. Q: What are the power options? All models come with a DC adapter that plugs into an AC power outlet. Q: Can I Take The Video Camera Outside? Yes, you can. Some video cameras have a line of sight range of up to 100 meters while others have a range of over 300 meters. Q: Will the Video Camera See in the Dark? Most of these cameras have infrared night vision to allow you to see your baby at night with the lights off. Q: Can I Have More Than One Camera? Q: How do I make baby videos? Simply connect your monitor to a recorder that will save all the footage you want your baby. When looking for the best baby monitor, know that it’s a device you’ll be using regularly until your baby is all grown up. We consider this device an investment that ensures you get peace of mind while sleeping. So, no matter what kind of device you’re looking at, you will get various options with different qualities and price points. Also, if you don’t need video capabilities, you could save some money by going for a sound only baby monitor.